The corruption runs deep and unfortunately crosses party lines with felonious potential. We are witnessing desperation from the swamp. TGP: Former Ambassador John Bolton went off on Robert Mueller, James Comey and Rod Rosenstein and their criminal investigation and pardon of Hillary Clinton during the 2016 election. Today there is mounting evidence the FBI changed the wording of their investigation in 2016 to clear Hillary Clinton of her criminal actions. Top FBI investigator Peter Strzok changed the wording of FBI Director James Comey’s statement to alter the bureau’s findings. This past week Deputy Attorney General Rod Rosenstein testified before the House Judiciary Committee. Rosenstein believes the Justice Department is doing an admirable job with their investigations. This was despite the latest information that top FBI investigators changed the findings to clear Hillary Clinton of criminal acts. Bolton told Stuart Varney Congress should cut off Rosenstein’s travel money and salary until he cooperates with Congress. Ambassador Bolton: When you see this evidence in the emails that Mr. Strzok sent to his girlfriend, or whatever she was, you’re not going to get more proof of the impact of the bias than these kinds of changes. And I have to say when Deputy Attorney General Rosenstein testified a couple of days ago he said he didn’t think there was anything wrong with Mueller’s investigation. He’s been in the government too long. You can’t find an FBI agent who will say, “We can’t indict Hillary Clinton because it will mean Donald Trump will be elected president. ” That’s not how the bias manifests itself. 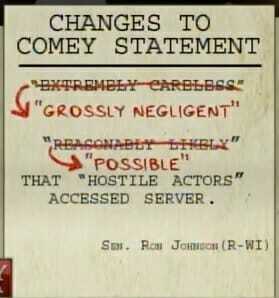 You see the bias here, you see what they did to the edits of Comey’s statement. That’s the linkage. That’s all you need. This was a very mishandled affair… Congress has got to get into this. They have to wield the financial arm against the Justice Department. If they don’t get answers from Deputy Attorney General they should cut off his travel money, cut off his salary.